There are now several billion media channels for PR freelancers and agencies to use to promote companies, charities and events. With new channels popping up every day, even seasoned professionals can find it bewildering, while for small firms trying to gain exposure can be a time consuming and frustrating task. Should you tweet it? Digg it? Facebook it? Or should you just bin it? If all else fails (or drives you a bit spare) why not try going back to basics and writing a press release? A press release? They’re dead aren’t they? Maybe not. OK so it’s a big scary virtual world out there, whether you’ve experience in the PR industry or not. The interesting thing about new technology is that there is very little new about it. Granted, the clever techie stuff with the wires and cables is relatively new, but the basic principles are very much the same. The internet in its many and varied forms is simply a communication tool; early forerunners included paintings on cave walls, carvings on slabs of stone, the concept of writing, pens, inks, printing, telegraphs and TV. As usual the human race has gone a long way to not get very far at all; we’re simply trying to get our message across. The press release, of the archaic variety, may seem old fashioned; however, the concept is not so out dated. An individual may well be able to craft the message, but if nobody is listening it’s no more than an exercise in wasting time. The message needs to be targeted and it needs to be placed where a lot of people will see it. The traditional press release (the print media variety) did this by grabbing the attention of an editor and then getting itself presented to a circulation of hundreds, thousands or millions, depending on the publication. Press releases targeted at specialist publications or magazines found themselves displayed to an audience that may well be interested in the exact same thing you’re selling. Simple formula and it’s not changed much. In addition to the print media uses of the press release (which shouldn’t be discounted even in our permanently on wireless world) there’s a host of opportunities presented by the internet. Social book marking sites offer the chance to find that perfect target audience for your product. Dedicated press release sites also exist to allow you to publish your press release to a global audience. Both techniques offer advantages. Using both types of site carefully, just like those old print media releases, can put your message exactly where you want it. For social book marking releases search sites that compliment your industry and target popular members who have an obvious interest in what you are promoting. Book marking sites offer the opportunity to make friends (much like Facebook) and doing so with individuals who have a good following and offer an authoritative view on products like yours, will help to increase your own profile and gather interest in your products. Avoid being spammy; unlike some search engines we could mention there are more real people and less robots in this game. It’s taken years for the techie types to develop algorithms to spot spam and they don’t always manage it that well despite a budget of billions. Social book marking sites, just like social networking sites, operate using real people to recommend “stuff”, not robots. Real people, despite the rumors, remain far savvier; they’ll spot spam and they’ll spot direct selling and they’ll click in the opposite direction. Press release sites are used by journalists who, despite the apparent flood of content on the internet, are still desperate to find good content or relevant content for their publications. Using the traditional press release format you might just be able to grab their attention and find that your release is syndicated for use elsewhere, generating the links beloved of those search engines and the traffic and conversions beloved of all internet marketers. Carlo Pandian is a freelance writer based in UK and blogs for Media Recruitment on jobs, careers and public relations. 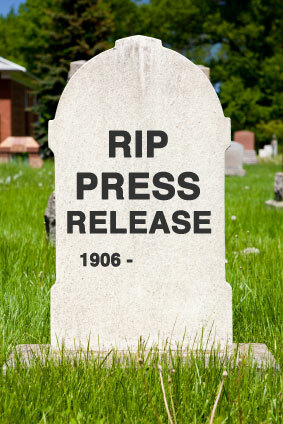 The press release, like all old media techniques, has evolved to live another a day online. Far from flat lining, the press release is finding its second (or third, or fourth) childhood; and it’s looking pretty vigorous. For PR freelancers this old trick is one that deserves some attention.